Distressed cap with a neon pink embroidered Villains logo! 100% cotton, 6-Panel, low profile unstructured cap. Metal buckle closure with hideaway strap. Represent Villains Jiu Jitsu X Demian Maia Los Angeles in this short sleeve stretch compression shirt with Villains logo on the front and Demian Maia logo on the back, both in neon pink! Made of 85% polyester/15% spandex and features a longer cut. Flat seams feel comfortable against the body. Avoid excessive heat or time when using machine dryer; hang drying is also recommended. Represent Villains Jiu Jitsu X Demian Maia Los Angeles in these unisex baselayer grappling spats! These tights have the Villains logo on the right leg and the Demian Maia logo on the left leg, both in neon pink. Featuring a draw cord elastic waist, a Qwik-Wik Moisture Transport System, and anti-microbial properties, to stay dry and odor free. Avoid excessive heat or time when using machine dryer; hang drying is also recommended. 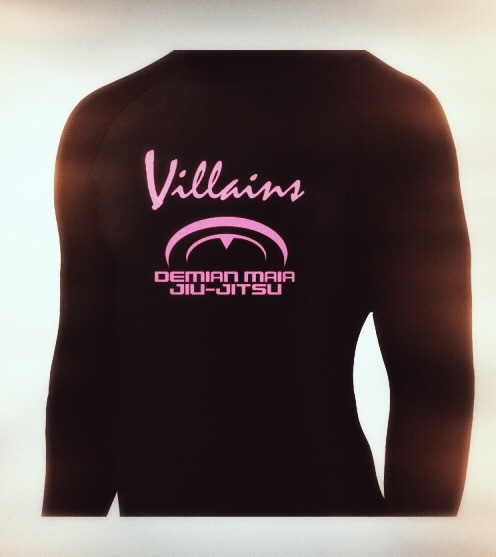 Represent Villains Jiu Jitsu in this long sleeve compression shirt! This has the Villains logo on the front in neon pink, and is made from 84% polyester and 16% spandex knit, with odor-resistant and moisture wicking properties. The 4-way stretch fabric allows for greater mobility and maintains shape. The flatlock stitching provides comfort and resists chafing. Ultra tight fit. Avoid excessive heat or time when using machine dryer; hang drying is also recommended. Represent Villains Jiu Jitsu X Demian Maia Los Angeles in this long sleeve compression shirt! 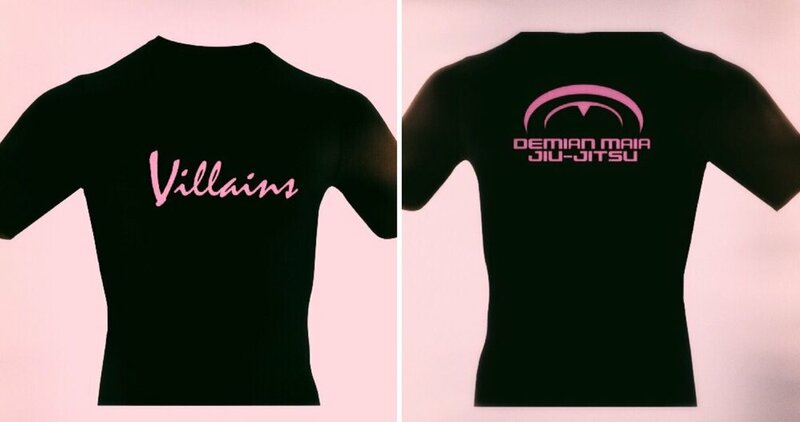 This has the Villains and Demian Maia Jiu Jitsu logos on the front in neon pink, and is made from 84% polyester and 16% spandex knit, with odor-resistant and moisture wicking properties. The 4-way stretch fabric allows for greater mobility and maintains shape. The flatlock stitching provides comfort and resists chafing. Ultra tight fit. Avoid excessive heat or time when using machine dryer; hang drying is also recommended. Represent Villains Jiu Jitsu in this long sleeve compression baselayer shirt! This has the Villains logo on the front in neon pink, and features a Qwik-Wik Moisture Management Transport System, compression fit, and a solid mock neck which is perfect to protect neck chaffing when worn under the kimono in gi training. Avoid excessive heat or time when using machine dryer; hang drying is also recommended. Represent Villains and Demian Maia in this long sleeve compression baselayer shirt! This has the Villains and Demian Maia logos on the front in neon pink! It features a Qwik-Wik Moisture Management Transport System, compression fit, and a solid mock neck which is perfect to protect neck chaffing when worn under the kimono in gi training. Avoid excessive heat or time when using machine dryer; hang drying is also recommended. Represent Villains Jiu Jitsu in this super soft full-zip hooded sweatshirt in grey acid wash burnout. This hoodie has a small subtle Villains logo beautifully embroidered in neon pink on the left chest! Features include: 60%/40% cotton/polyester, flatlock stitching throughout, dyed-to-match drawcords, a brushed nickel concealed zipper, split-front pouch pockets, raw edge seams around the hood opening, pocket seams, cuffs, waistband, zipper placket and side seams. * Please note that our website contains links to websites owned and operated by third parties. If you use these links, you leave our Website. These links are provided for your information and convenience only and are not an endorsement by Villains Jiu Jitsu, LLC of the content of such linked websites or third parties. Villains Jiu Jitsu, LLC is not responsible for these websites or their content or availability. Villains Jiu Jitsu, LLC therefore makes no warranties or representations, express or implied about such linked websites, the third parties they are owned and operated by, the information contained on them or the suitability or quality of any of their products or services. Subject to paragraph below, if you decide to access any third party websites and make use of the information contained on them, and/or enter into any contract for the supply of goods or services from such third party, and/or make any donations to such third party (including Logo Sportswear Inc.), you do so entirely at your own risk. Villains Jiu Jitsu, LLC accepts no liability for any damage or loss, however caused, in connection with the use of or reliance on any information, material, products or services contained on or accessed through any such linked website. This disclaimer also applies to links to retailers or other sellers of Villains Jiu Jitsu products and if you wish to purchase Villains branded products from such retailers, we are of course delighted, but Villains Jiu Jitsu is not a party to any such contract for the purchase between you and any seller. Any product related inquiries, disputes, etc., shall be made entirely between you and such retailers, venders, parties etc.